Dogs who get enough exercise are happier and more relaxed in their environment. Particularly, those with weight or joint troubles often feel better and have more energy when they get regular exercise. Why not let your pup come play with us, romp in the woods, and splash in a creek while you’re hard at work? He’ll come home happy and ready for a nap! 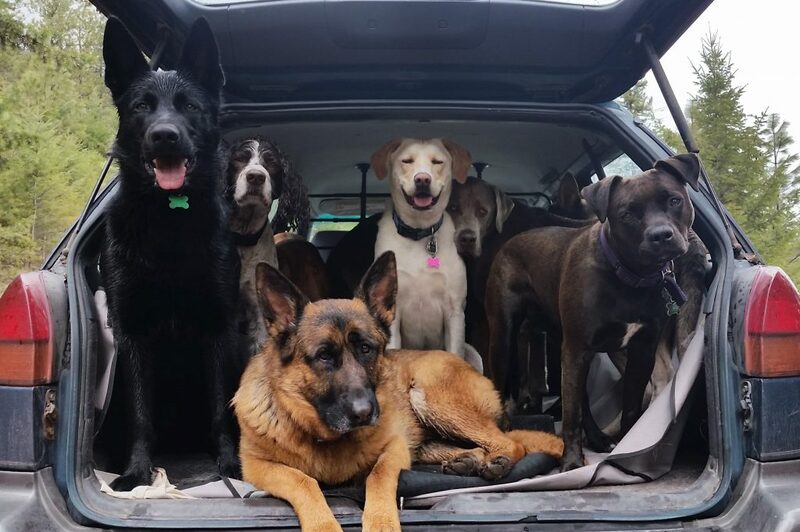 Our hike groups consist of one person and up to ten dogs. We can pick your dog up or you can bring him to Quick Paws before the scheduled departure time. The total hike time excludes travel; the clock doesn’t start until the hikers’ paws hit the trail and stops when the last dog loads back into the car. 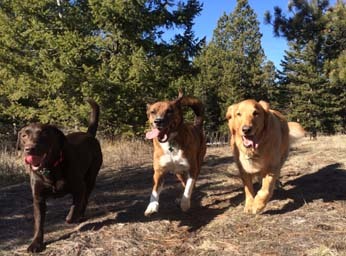 As with daycare and boarding, all dogs joining us for hikes must be friendly with other dogs and complete our introductory paperwork prior to their first hike. All dogs must be at least four months old, fully vaccinated, and spayed or neutered after six months of age. We recommend dogs be at least six months old to do frequent 2-Hour hikes and one year old for a 3-Hour hike to avoid over-stressing developing young bones and joints. We hike on private land or on federal Lolo National Forest property. Water is provided during and after all hikes, and we’ll give you as much notice as possible if we must cancel a hike due to extreme weather or poor air quality conditions. Reservations are recommended, and 24-hours’ notice is required if you must cancel a hike reservation. We limit our intake of new dogs to be sure we give our absolute best attention to pets already in our care. We limit our capacity for group hikes and our waiting list for new clients is usually several months (and occasionally as long as twelve months). Call now to get on our waiting list! Of course, your dog must be fairly reliable off-leash, physically healthy, and enjoy hiking with a group. We will do our best to keep your dog safe and accounted for at all times, but there are significant risks involved in off-leash dog hikes in the woods. Some dogs may run away as the result of unpredictable encounters with horses or deer, while others simply become disoriented or choose to not stay with the pack. If your dog runs away on one of our hikes, search services may be at your expense; Quick Paws may waive or discount search fees at our discretion. 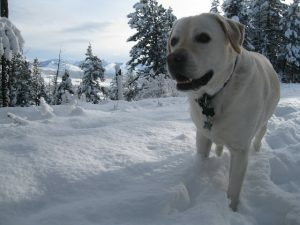 Losing your beloved pet is a terribly traumatic and scary experience, and you should weigh these risks carefully before signing up your dog for off-leash hikes. If you are concerned your dog might wander away, we offer GPS tracking ($10/hike) to insure we know where she is roaming at all times. We offer this service free of charge for the first hike. Although GPS doesn’t guarantee the safety or exact location of a dog at any time, it certainly makes it easier to keep track of your dog if she tends to wander. so let us know if your dog would like to go. We’ll call you if the hike is on! Our daily hike pictures are worth a thousand “woofs”! We take photos on every group hike and post them within 24 hours. We sell copies of the photos, so make a note of your favorites!